DJ Undoo was the winner of the LUCKY BASTID competition. He will represent Romania at the Red Bull Thre3style World Finals in Toronto on Wednesday, November 6, 2013! DJ Undoo (Alexandru Damian Mihaila) is a Romanian Dj, Turntablist, Producer, Sound Engineer, and Promoter. He’s been on the decks since 2000, establishing his first independent lable, Avangard Miuzic, in 2003. Since then he’s been part of Urban Records, associate at Hades Records, and opened his first studio, DAW Studio, in 2006. He’s produced several album and has been part of numerous festivals and competitions. What started as an underground experiment back in 2007 has quickly grown into the world’s largest DJ competition and, for the first time, the Red Bull Thre3Style World Finals will hit Toronto thisNovember. Inbound from the four corners of the globe – from Albania to Australia, from Jamaica to Japan – the 21 top DJs on earth will take over the city of Toronto to compete for the title of Red Bull Thre3style World Champion. Over a weeklong series of world-class music events, each DJ will engineer and perform a crowd pumping, 15-minute music set mixing at least three genres of music to a full house of concertgoers and judges, in order to showcases technical prowess and melt the dance floor. All will come down to the World Championship final competition on November 9, where the last five DJs standing will battle for ultimate sonic supremacy and the most coveted DJ title on earth. With so many countries qualifying, the World Finals competition will take place across the entire week of November 4th, with winners from each night eventually heading to Saturday’s final. 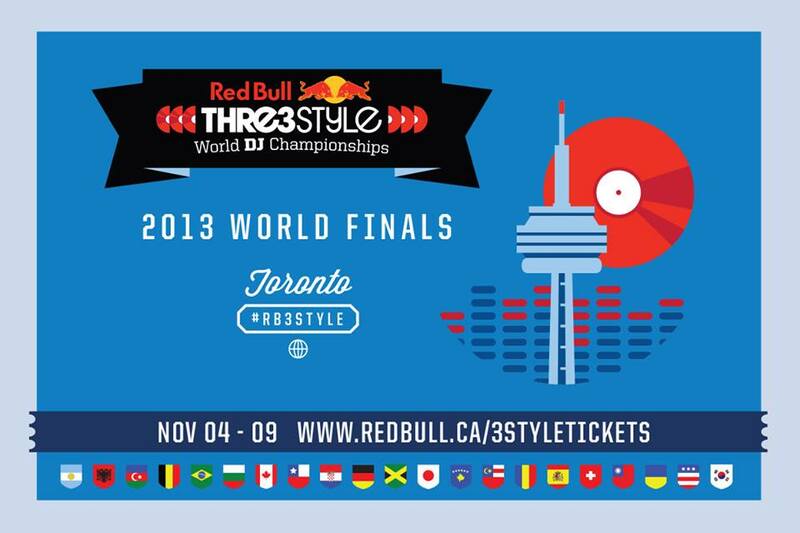 On Monday November 4th The Drake Hotel will play host to the official Red Bull Thre3Style 2013 World DJ Championships Welcome Night Presented by Sennheiser. The doors open at 9pm and it is free to the public. There promises to be surprise performances by DJS from across the world and it will be a night not to be missed. We suggest you arrive early if you want to be in the mix. $1000 Red Bull prize pack including tickets to the championship final. Canadian turntable Legend Kid Koala teams with Invisibl Skratch Pikl Shortkut and Toronto’s legendary turntable crew the Turnstyles to headline the first night of competition at the Adelaide Hall. The 2nd night of competition will feature performances by the legendary DJ Jazzy Jeff alongside his Red Bull Thre3Style pal Skratch Bastid. The night will also see performances from local hero Starting from Scratch as well Red Bull Thre3Style world champions Four Color Zack and Hedspin. One of the biggest names in DJing – Canada’s own A-Trak – is set to take over the Hoxton. He’ll share the stage with some more of Canadian Club’s finest, Toronto’s Torro Torro & Calgary’s Smalltown DJS. For the 4th night of Red Bull Thre3Style competition, the Native Tongues are in effect with A Tribe Called Quest’s Ali Shaheed Muhammad and De La Soul’s Maseo going back to back, plus long time Red Bull Thre3Style affiliate the one and only Cosmo Baker. For the final night of competition, local talent takes over the headliner duties, TORONTO stand up. All of these Canadians will share the custom built world finals stage to take the audience on a journey like only Toronto knows how. This night will also be the night that the 2103 winner of the Red Bull Thre3Style World DJ Championships will be announced so let’s party!